Apoptotic signaling pathways engaged by PARAs that target the death receptors DR4 and DR5. There are several potential strategies to improve the clinical efficacy of these PARAs. One strategy would be to augment potency by increasing the oligomeric state of Apo2L/TRAIL or the affinity of agonistic anti-DR4 or anti-DR5 antibodies for Fcγ receptors (blue asterisks). Another strategy to improve efficacy would be the implementation of predictive and pharmacodynamic diagnostic biomarkers that might help predict or determine whether a patient’s cancer is sensitive (green asterisks) or resistant (red asterisks) to PARA treatment. A third approach would be to improve synthetic lethality against cancer cells by combining PARAs with pharmacological agents that target various other intracellular signaling components or modulators of the apoptotic pathways (black asterisks). 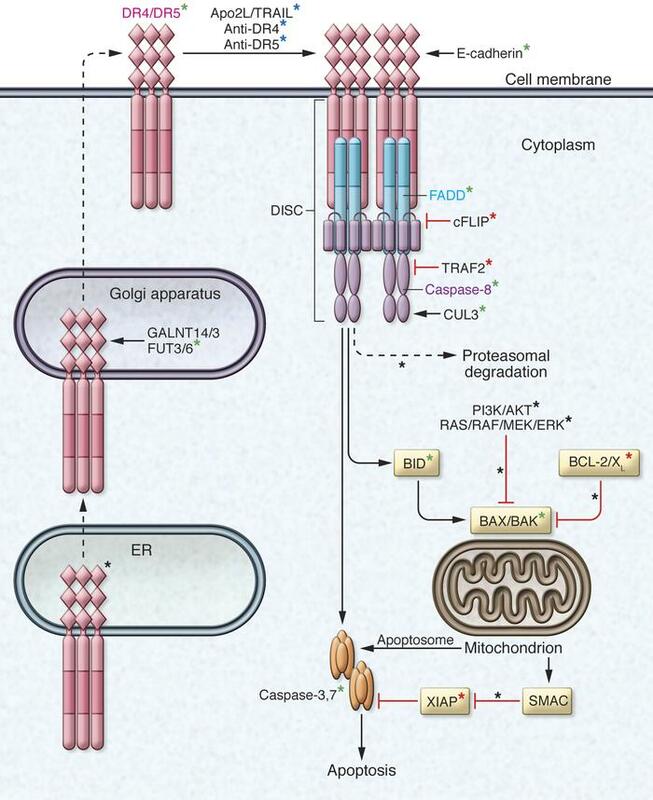 BAX/BAK, BCL-2–associated X protein/BCL-2 antagonist killer 1; BCL-2/XL, B cell lymphoma-2/extra long; BID, BH3-interacting domain death agonist; cFLIP, cellular FLICE-inhibitory protein; CUL3, cullin 3; DISC, death-inducing signaling complex; FADD, Fas-associated death domain; FUT3/6, fucosyltransferase 3/6; GALNT14/3, polypeptide N-acetylgalactosaminyltransferase 14/3; SMAC, second mitochondria–derived activator of caspases; TRAF2, TNF receptor–associated factor 2; XIAP, X-linked inhibitor of apoptosis.